Three men were charged with malicious damage to property at the Goodman Gallery on Tuesday. Two were charged for defacing the controversial painting of President Zuma. One was charged for his unfinished graffiti on the gallery fence. What followed was a bizarre attempt to deceive journalists and co-opt the suspects. After the three suspects, 25-year-old Louis Mabokela, Maile Moyo (54) and Barend la Grange (58), were taken to Rosebank police station at 12:00, confusion ensued as to just who their lawyers would be, with both parties having links to the ANC. Xolani Mofokeng, from TGR Attorneys, was present by the time a small group of journalists arrived and said he represented all three suspects. TGR was founded last year by Peter Tshisevhe, Sandanathi Gwina and Matodzi Ratshimbilani. Tshisevhe reportedly left his previous firm, incensed when the firm dropped Julius Malema’s “shoot the boer” case he was working on. Ratshimbilani has been described as a party lawyer. Krish Naidoo, from KN Attorneys, waltzed in later claiming to represent Mabokela. Naidoo has had a long involvement with the ANC. Mabokela may press charges against the security guard who head-butted and body-slammed him, said Naidoo. Naidoo explained that Mabokela is a taxi driver from Modjadji, Limpopo, and has a faint interest in art. He said the suspects don’t know each other and it was an uncanny coincidence that two were in the gallery with the same idea at the same time. They painted over Brett Murray’s controversial The Spear of the Nation while public attention was focussed elsewhere on the South Gauteng High Court. The ANC was trying to get Goodman to take down the painting and City Press to withdraw online copies. The party will be back in court on Thursday. Three men, who described themselves as friends of Mabokela, waited for him outside the station. “He’s not an artist,” said one. They said they’d ask him why he defaced the painting, but they didn’t think it was due to religious views or support for Zuma. “Maybe very traditional,” said one friend. The suspects had appeared only briefly, taken from room to room, when the afternoon set. Half of the waiting journalists left the station with complaints about the inordinate time it was taking to process the charges and release the men on bail. After dark came the attempt to release the men without them meeting the media. Finishing his shift, a sergeant summoned journalists by shaking a set of cell keys. He said it could be well into the night when they’re released and the media shouldn’t bother waiting. The warrant officer who took over tried much harder. The son of La Grange had arrived, but refused to talk to journalists. If he was there, his dad was there, thought the press. But by 20:30, the son, who didn’t want to give his name, walked to his car and drove off. The warrant officer took a police vehicle and also left. The police were adamant the three men had been taken in the vehicle. But the son returned and SAPS national police spokesman Vish Naidoo said the men hadn’t yet posted bail. Krish Naidoo arrived after leaving earlier and also said the men hadn’t posted bail. Yet the warrant officer was adamant: They’re wrong; the men had left and journalists were wasting their time. There were various signs that crime intelligence was trying to get involved in yesterday’s proceedings. As 25-year-old Louis Mabokela and Maile Moyo (unconfirmed) are about to be released, a man who looked to be head of a likely crime intelligence group watches on. He tried to take them in his GTI and chased after the cars when they left. La Grange’s son sat inside the station, waiting, until a man dressed in a tunic came quietly to speak to him. Shortly after, the son left again. With another reporter, the Daily Maverick found the man in the tunic sitting in a black GTI, known for their use by crime intelligence, with two other men. Questioned through the crack of the window, he stared silently ahead with an earpiece visible. After an hour, the son was spotted waiting at a local garage. Later, he admitted that the whole effort was tiring and seemed unnecessary. After he returned at 23:00, the men (who were obviously inside the station, despite the warrant officer’s claims) were finally ready to be released. The man in the tunic leaned against the police desk clipping his nails. The men walked out of the station after 11 hours and went in different directions. La Grange went with his son, Moyo with an unknown man and Mabokela with his lawyer, Naidoo. The man in the tunic tried to direct them into the GTI then chased after the cars once they left. The three men will appear in Johannesburg and Hillbrow magistrate’s courts tomorrow. Throughout the night, the police continued to misinform the media, who saw too many discrepancies in the comments and too many strange coincidences to be deterred. Who ordered the police to try to get the men out of the station without talking to the media? Why? Why did policemen lie to journalists and co-opt a suspect’s son to help trick them? Why did it seem like crime intelligence was present? Something’s not right at all, said a journalist who was forced to wait in the cold. 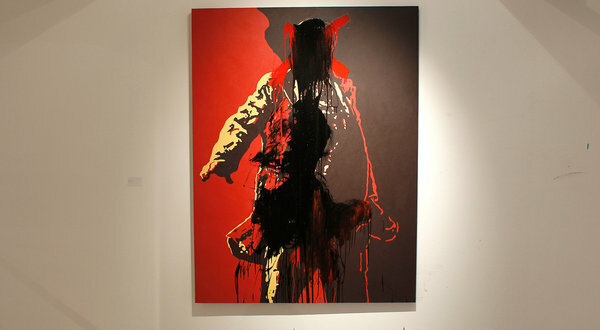 The ANC fanned the flames of controversy over the Zuma painting. And by yesterday’s events, it’s clear someone still wants to poke the coals. One thing’s for certain, it’s someone a lot higher up than a taxi driver from Limpopo and his two unconfirmed accomplices whose hand is on the poker.